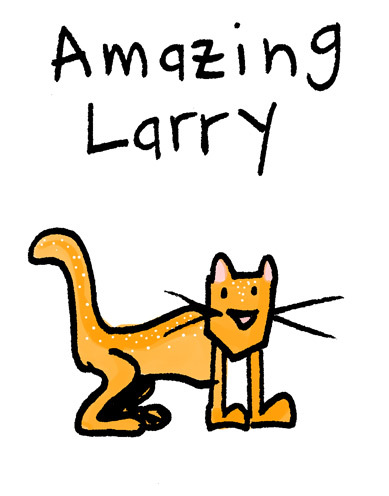 A few weeks before I moved to Portland, I had the pleasure of meeting an orange cat named Amazing Larry. Although our time together was brief, I will always remember his charm, selflessness, and optimism in the face of seemingly insurmountable obstacles. 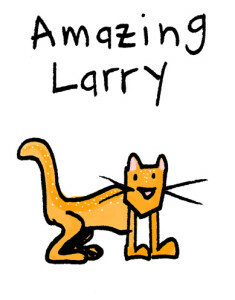 I miss Amazing Larry – he was a good cat and I was glad to meet him. It was March in Boulder, so the weather was still quite cold. It had snowed Saturday and Sunday and it was in the 20s outside. I saw, Sunday night, a note in our apartment building left by a neighbor. The note said that they had found a cat and they let the cat stay in their apartment for the night. Monday morning, I was on the way to the gym when I noticed a cat in the stairwell. Odd, since there aren’t usually animals hanging around in the stairwell – it’s closed off both to the outside and to each floor of the building. I got back home an hour or so later and the cat was still there. He trotted right up to me when I entered with my bike; usually cats are scared of large metal objects, but this one was unafraid. I set my bike down and took a look: he was orange with white speckles. He looked like an outdoor cat: short hair, muscular, friendly with strangers like me. He followed me up and I had to close the door quickly so he wouldn’t come in my apartment. After I took a shower I came back out and he was still in the stairwell. I decided that I needed to do something. I fed him. I took the food outside, thinking he’d eat it then go on his way. Not so. He meowed at the door to the apartment building. He had a very loud meow, and it was cold outside, so I felt like I couldn’t just leave him out there. I also didn’t want to adopt a cat who was likely just too cold to walk back to his home. The best thing to do was take him to the humane society (there’s a good no-kill shelter where we got our cat). I walked out to the car and he followed me. I put him in the car and started it up – I figured I’d turn on the heat so he’d be happy while I brushed the snow off the windows. I finished, then noticed he had peed on my seat. I turned off the car, picked up the cat, and took him back to the apartment to get some cleaner and paper towels. Our cat Sambora was awake. I opened the door, the orange cat trotted inside, and Sambora was on the scene. 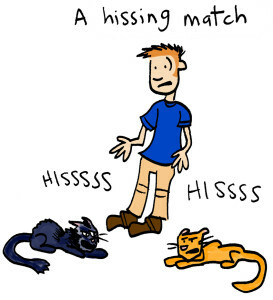 I’m not going to place blame on who started it, because I don’t honestly know, but what followed for several breathless moments was a colossal hissing match. Both cats, taken aback, I suspect, at the unexpected presence of another cat , hissed at each other. Before violence ensued, I hastily ushered the orange cat outside the apartment, shut the door, and ran to get the cleaner. To his credit, he waited for me outside my door. To Sambora’s credit, she immediately forgot the incident ever happened. 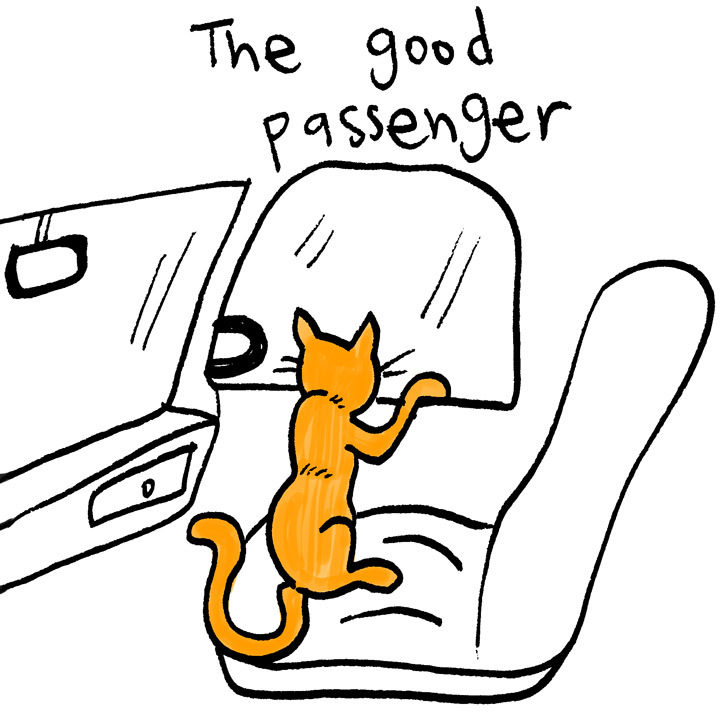 On my way back, I didn’t have to carry the orange cat; he followed me downstairs and into the car. 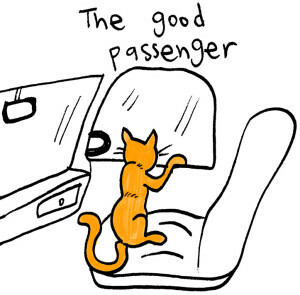 The cat was a great passenger. He looked out the windows, explored the backseat, and sat next to me for a while in the passenger seat. Whenever we stopped at a light, people would wave to him. When we got to the humane society, I picked him up so he wouldn’t run away, but he didn’t want me to carry him. I set him down and he led the way to the door. I opened the door for him and he trotted inside and acted like maybe he’d been there before. 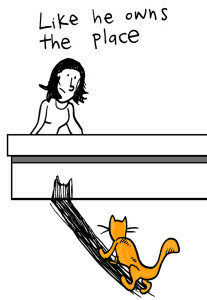 The woman at the counter looked first at the cat who so matter-of-factly walked in the door. Her eyes then made contact with mine and she seemed a little relieved that the cat had not come in on his own. She checked him out and found that he had a microchip. His name was Amazing Larry, and they also had an address where he lived. The woman called his owner but she wasn’t at home, so I left Larry there to wait for his people to come pick him up. She asked if I wanted to be on the adoption list in case the owner did not turn up, but I had to decline, remembering that he and Sambora had not exactly hit it off. On my way home, and many times since, my thoughts turned to Amazing Larry. He was a good companion, was cheerful in spite of his being trapped in a stairwell for hours, gave me the courage to face my inner demons and vanquish them. He was one of those rare individuals beautiful both on the inside and on the outside. May his legend live long and may poets sing his name in generations to come. What, I don’t count as a reader? I think I remember hearing about AL, although I was not aware that he peed in the car. I wonder whatever happened to him. You should definitely write more cat stories. I like them! You count as two readers, and your money’s no good here. I wonder about AL, too. Maybe he’ll read this blog and we can find out! A riveting tale with an ending that soars. And congrats to the owner for choosing a truly excellent name. Speaking of awesome pet names, I came across a dog today with the name Biscuits Jackson. Yes, plural biscuits. Too cute.